Not to be confused with Eastham. This article is about the district. For the parliamentary constituency, see East Ham (UK Parliament constituency). A settlement in the area named Ham is first recorded as Hamme in an Anglo-Saxon charter of 958 and then in the 1086 Domesday Book as Hame. It is formed from Old English 'hamm' and means 'a dry area of land between rivers or marshland', referring the location of the settlement within boundaries formed by the rivers Lea, Thames and Roding and their marshes. In 1859 East Ham railway station opened and, although in 1863 the area was still being described as a "scattered village" the availability of transport resulted in increasing urbanisation, especially from 1890 onwards. The electric services of the District Railway first served East Ham in 1908. In 1894 East Ham formed the East Ham Urban District of Essex and was incorporated as a borough on 10 August 1903. As a result of popular pressure, East Ham sought and obtained the county borough status. 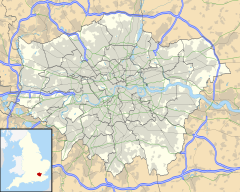 It became, in modern terms, a unitary authority on 1 April 1915 and remained such until 1965 when it was abolished and the County Borough of West Ham merged with its former area to form the London Borough of Newham. The principal offices of Newham Council were at the junction of Barking Road and High Street South in the former East Ham Town Hall, a Grade II listed Edwardian structure designed by A. H. Campbell, H. Cheers and J. Smith, which included a landmark clock tower. Built between 1901 and 1903, Passmore Edwards opened the Town Hall on 5 February 1903. The council moved to Newham Dockside (Building 1000, Dockside Road E16) in 2009. East Ham is also the name of a parliamentary House of Commons constituency East Ham, which covers East Ham and neighbouring areas. The current Member of Parliament is Stephen Timms. Housing in East Ham consists principally of Victorian and Edwardian terraced town houses, often in tree-lined avenues. There are many green spaces in the otherwise bustling and urbanised area of East Ham. The graveyard of the Norman St Mary's church, is maintained as a nature reserve, the largest of its kind in Greater London. Central Park (Central Park Road) and Plashet Park (Plashet Grove) are the two largest parks in East Ham, and both combine open space with playgrounds and cafés. There are also smaller play areas and parks, including Priory Park (Grangewood Street) and Flanders Field, where England football captain Bobby Moore played as a child during the late 1940s and early 1950s. Flanders Fields is currently the home ground of Flanders FC and other is used by Bonny Downs Community Association (BDCA) and other community groups. East Ham is a multi-cultural area, with a majority of South Asians and African, Caribbean and eastern European residents. As of 2010, East Ham has the fourth highest level of unemployment in Britain, with 16.5 percent of its residents registered unemployed. Around 7 in 10 children living in East Ham are from low income families, making it one of the worst areas in the country for child poverty. Founded in 2011 in a former glass factory, it has various uses; as an art space, as a gallery and for events - it is independent, grassroots and community focused. Newham Council running a number of subsidised or free support programs for locals such as the ParkLives scheme. Run by CocaCola in association with Active Newham, free activities are hosted in Newham's parks, including Yoga, Tennis, Rounders and other social sports. East Ham has its own Women's Institute group, formed in 2016. The group meets every second Tuesday of the month. A modern WI, they host activities and talks as well as running a pop up cafe at local events such as; The Newham Show  and local art exhibitions. Bike from Boleyn was set up by the Boleyn community in 2016. They host a bi-annual bike ride from Upton Park to West Ham's new stadium in the Olympic Park to promote and preserve the historic, community and economic links between Boleyn and West Ham United as well as the local area and community networks. This also highlights the Greenway, London as an important Newham asset linking the East and West of the borough, and encourages cycling in the borough. The Greatfield Residents Association is a local residents association based in East Ham South (This area used to be an electoral ward known as 'Greatfields', which is where the name is from). Their objective is to promote the local area and create 'a sense of togetherness'. The group meets regularly and publishes a biannual newsletter, as well as being involved in local events and working with the council to encourage improvements to the area. In 2016 they also set up a quarterly craft and food market, funded by the Evening Standard Dispossessed Fund, to showcase local talent and diversity. Transport connections are provided at East Ham Underground station and bus services which form a hub near the Town Hall. East Ham station is served by the District and Hammersmith & City lines. To the north of East Ham is Manor Park and Little Ilford, to the east over the North Circular Road is Barking, to the west is Upton Park and to the south over the A13 is Beckton and London City Airport. There are numerous places of worship for many different religions, ranging from St. Michael's Church to Kensington Avenue Temple. The Parish Church of St Mary Magdalene dates to the first half of the 12th century and is claimed to be the oldest parish church still in use in Greater London. It contains a memorial to an Edmond Nevill, who laid claim to the attainted title of Earl of Westmoreland in the 17th century. Due to the significant minority of South Indians, particularly people of Tamil extraction, there are two Hindu temples in the area. One is dedicated to Mahalakshmi and the other to Muruga. The latter temple was recently rebuilt with a larger prayer hall and traditional temple tower as is typical of Tamil temples in South Asia. Due to a very large Muslim community, East Ham also has many mosques. Some of the mosques include the Masjid Bilal & Islamic Centre and the Madina Masjid & Muslim Cultural Centre. The local football club, East Ham United were dissolved in 2001. They merged into Barking & East Ham United, and the merged club was dissolved in 2006. Prior to West Ham United's relocation to the London Stadium in 2016, they were based at the Boleyn Ground, on the western border of East Ham and the eastern border of Upton Park, in the Tudor ward. Elizabeth Fry, English prison reformer, social reformer and Christian philanthropist. Idris Elba, an English actor, musician, voice actor, and DJ. Dame Vera Lynn, DBE, singer, songwriter, and actress whose musical recordings and performances were enormously popular during the Second World War. ^ 'Becontree hundred: East Ham', A History of the County of Essex: Volume 6 (1973), pp. 1-8 Archived 28 September 2007 at the Wayback Machine accessed: 26 April 2007. ^ "ParkLives Newham". Active Newham. Active Newham. Archived from the original on 5 March 2017. Retrieved 3 May 2017. ^ "In the Market for Fun". Newham Magazine. No. 334. Archived from the original on 5 May 2018. Retrieved 3 May 2017. ^ "Greatfield Residents Association". Greatfield Residents association. Wordpress. Archived from the original on 13 September 2017. Retrieved 3 May 2017. ^ "Lifestyle bloggers in London's hottest postcodes". Evening Standard. Eveing Standard. Archived from the original on 20 February 2017. Retrieved 3 May 2017. ^ "EAST HAM UNDERGROUND STATION". www.tfl.gov.uk. Archived from the original on 17 March 2015. Retrieved 17 February 2015. ^ 'East Ham: Churches', A History of the County of Essex: Volume 6 (1973), pp. 25-31 Archived 28 September 2007 at the Wayback Machine accessed: 26 April 2007. ^ "Mosques in East Ham, London (5)". mosques-map.muslimsinbritain.org. Archived from the original on 27 October 2014. Retrieved 16 February 2015.